Before using filtered index I strongly recommend everyone to go through the article INSERT/UPDATE failed because the following SET options have incorrect settings: ‘QUOTED_IDENTIFIER’. 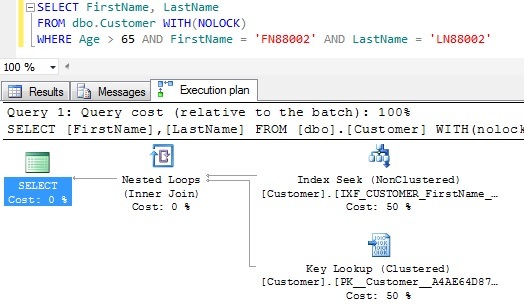 Basically, adding a filtered index on a table may cause the existing working stored procedure to fail if the stored procedure was not created with a setting which doesn’t meet the filtered index prerequisites. Let us first create a customer table with hundred thousand records as shown in the below image by the following script. 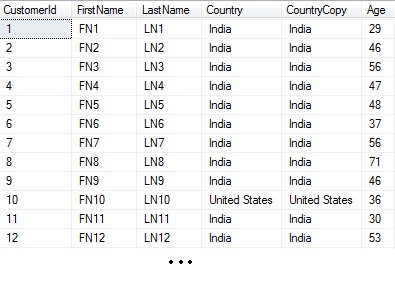 Note Customer tables Country and CountryCopy column type and values are same. And also every tenth record has the Country/CountryCopy column value as United States and rest of the records column value as India. Also the age column value between 18 to 75 years. So, from the above result it is clear that the number of records in the filtered index is equal to the number records in the table which matches to the filter criteria, so the filtered indexes requires less storage space and they perform better from performance perspective. 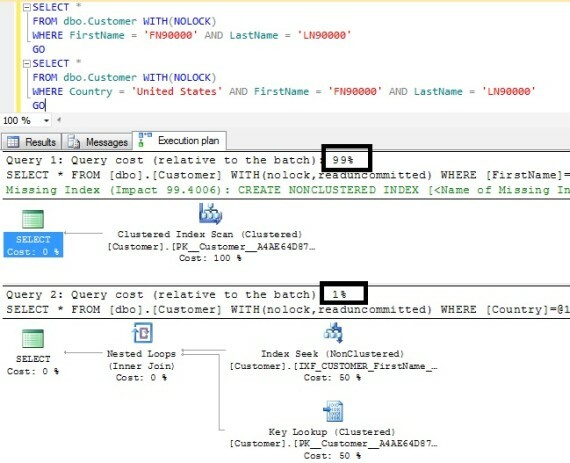 From the above result it is clear that the query which uses filtered index has a cost of 37% whereas the query which uses classic index has a cost of 63%. From this result it is clear that the query which uses filtered index performs better. If we know that the look-up on the Customer tables record by FirstName and LastName is always for the United States customers. Then in such a scenario, a filtered index like below is more suitable than having a regular non-clustered index. This index will only index the records whose country is ‘United States’ by FirstName and LastName. And also observe that the Country column is used in the filter criteria, but it is not a key column of the index. Note: This index will not be used if country of the customer is not ‘United States’. 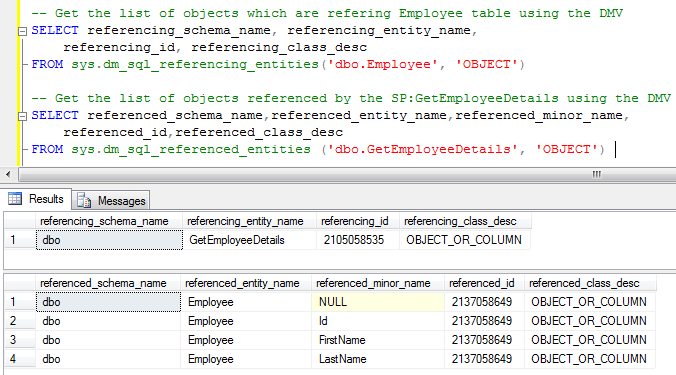 Let us try executing the below query and see whether it is using filtered index created in the previous example (i.e. example 2). From the above examples it is clear that the filter index’s filter expression need to be part of the queries WHERE clause to force it’s usage. 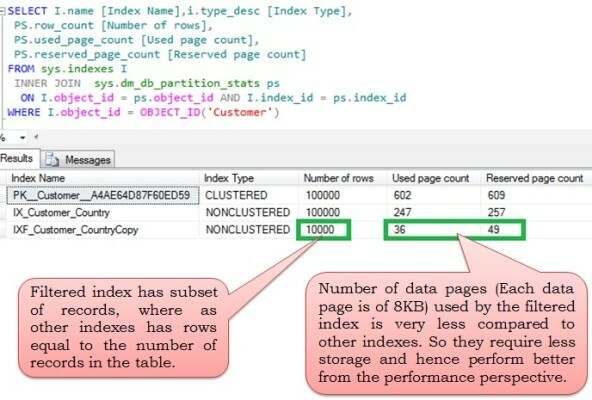 EXAMPLE 4: Whether I can specify the index hint for the query to force filtered index usage instead of writing the filter expression of the filtered index in the queries WHERE clause? So, from the above result it is clear that we can’t force a filtered index usage by specifying the index hint, instead of it as explained in example 3 the WHERE clause of the query need to have filtered index’s filter expression. EXAMPLE 5: Whether using a local variable instead of the constant of the filter expression of the filtered index’s in the queries WHERE clause still results in the usage of the filtered index? From the above query result it is clear that we can’t replace the constant of the filter expression of the filtered index in the queries where clause by a local variable. 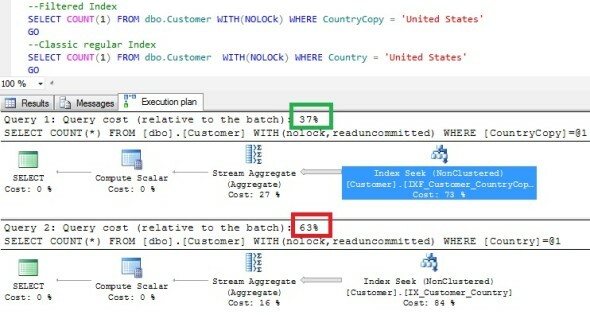 EXAMPLE 6: Whether the WHERE clause of the query need to have the same constant expression as specified in the Filtered Index’s filter expression to force the filtered index usage. Let us create a filtered index on the FirstName and LastName column with filter criteria as Age > 60. Note: For the customer with FirstName = ‘FN88002’ AND LastName = ‘LN88002’ the age column value is 72. So, from the above example it is clear that if the queries WHERE clause has the same constant expression as the filtered index’s filter expression, then the filtered index is used. Let us change the WHERE clauses Age > 60 condition to Age > 65 and see whether the query is still forcing the usage of filtered index. From the above result the query is still using the filtered index when the WHERE clause Age > 60 condition is changed to Age > 65. Now let us try to change the WHERE clauses Age > 65 condition to Age > 55 and see whether the query is still forcing the usage of filtered index. From the above result it is clear that the query is not using the filtered index when the WHERE clause Age > 65 condition is changed to Age > 55. So, the conclusion is: the constant expression specified in the queries WHERE clause should be same or subset of the filtered index’s filter expression to force the filtered index usage.